The Laurence Pomeroy Trophy is awarded to John Ellis of St Peters, South Australia for his outstanding contribution to the history and heritage of the pre-GM Vauxhalls, particularly through his collection of early Vauxhalls from across Australia and their restoration and return to the road. OD1076 has a new home! Another 23-60 has found a new home..........in North Wales. OD1076 joins 3 other similar cars, making this area the most densely populated 23-60 location in the world! OD1076 is already well traveled. After a life of enthusiastic campaigning in Australia with Harry Thomsett, this car moved to Jersey, Ireland and then recently to England. "I met a chap today who is the son of a now deceased vintage enthusiast from Melbourne, one Jim Martin from Preston (Vic). I remember visiting Jim sometime in either the late 70's or very early 1980's and he showed me images of a 23/60 seven passenger saloon which he used to own. He told me at the time that he had sold it to someone from the UK. 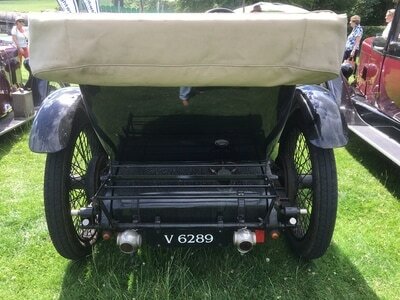 Well, his son says that it was a Grosvenor saloon and confirmed the above details plus that it had a 'V' windscreen. The buyer was ex pat Aussie Murray Rainey who is now also deceased. The other bit of information was that Rainey allegedly hacked off the roof of the saloon so it would fit in the container and the son also claims that his recollection is that the car had engine number OD110. I have checked the register and cannot find an engine OD110 in the UK though there is a car listed with that chassis number in Bristol?" "My Vauxhall was 'discovered' some 40 years ago by a friend of mine. It was outside a farmhouse near Bristol being renovated, under a tarpaulin minus its roof but with unattached doors. The cylinder head had been removed and the engine was seized. The then owner told us he was going to restore it but some months later he contacted my friend asking if he wanted to buy the car. 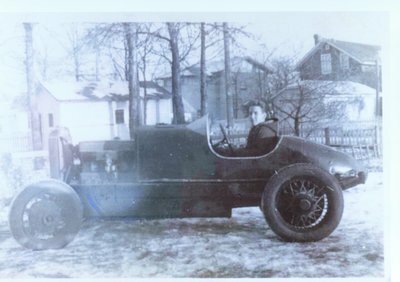 Because he worked abroad and was restoring a Delage at that time and anxious for the Vauxhall to be better preserved he contacted me. I at that time was building a house and was restoring a Sunbeam, but I had secure dry storage. Thus the car came into my ownership. Because of other commitments I was unable to do anything to the Vauxhall until 10 years ago. It was in a ruinous condition and all the woodwork was rotten, much of it missing. I had over the intervening years found missing parts for it including instruments, magneto etc. and had managed to free the engine. 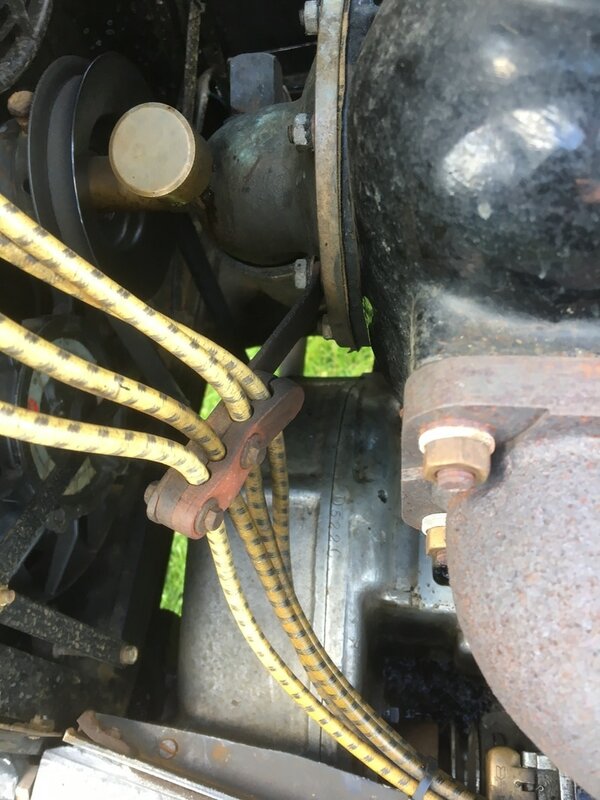 Mechanically the car was completely worn out and from the state of the engine, which was also full up with sludge deposits, it had been neglected previously until it refused to run anymore. I therefore set about a full restoration including a new body. A new limousine/saloon body was for many reasons a non starter. I did not want a replica 5 or 7 seat 23/60 body, for which in any case there were no drawings ( I already have a 21 Hp. Lanchester 5 seat tourer) or a 30/98 copy so through a friend I used drawings and a bodybuilder in Wooton Bassett of a similar body which had been fitted to a Crossley 19.6. The chassis dimensions were almost the same, and he still had the patterns. Thus you see it much as it is today back on BE edge wheels. There is still work to do mainly upholstering and painting but mechanically it is complete and usable. 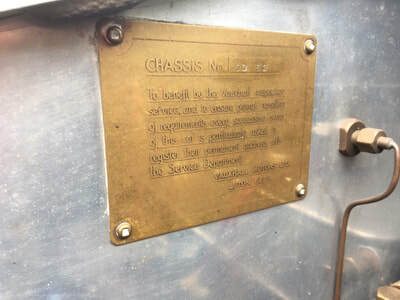 The Engine is clearly stamped OD 110 and during restoration the chassis number came to light from under the grime on the inside of the bonnet and beneath the remains of the running boards as 109." More pictures here. Now here's the question. John Kent has found a photo of an early 23-60 with Grosvenor saloon body, taken in Melbourne in the 1950s. Is this OD110 (click here)? Don't have much history about you car? Then you must start researching it. Today! I acquired OD854 in 1997 from its first UK owner - the car was imported from Australia in 1993. The only document with it was the auction catalogue from the Rainsford Collection auction in Melbourne. 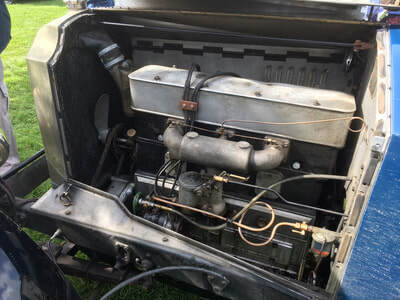 Family life and career intervened, and I only got around to doing any serious research on the car's history earlier this year, prompted by the planned trip to Australia. 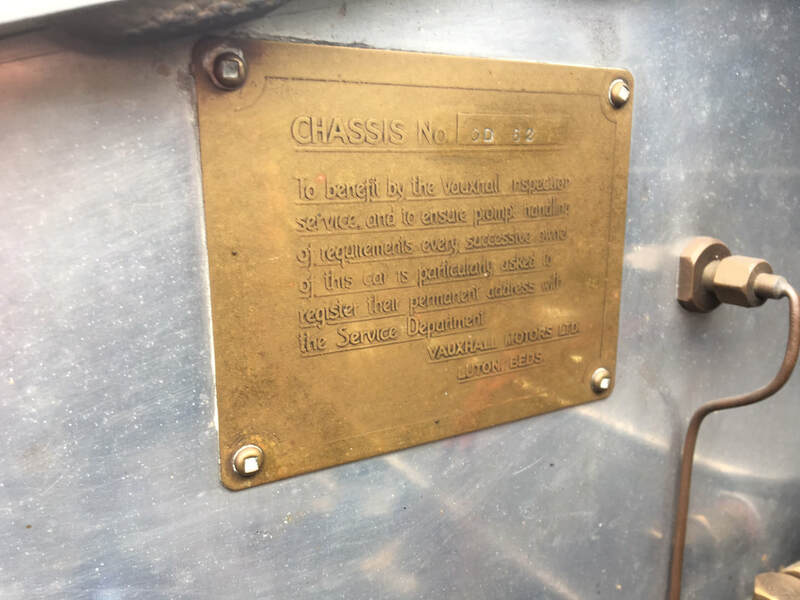 ​With help from several Vauxhall enthusiasts in Australia, I now have details of the car's owners back to 1952, several period photos (click here), and best of all we met a previous owner and his wife on our recent trip. 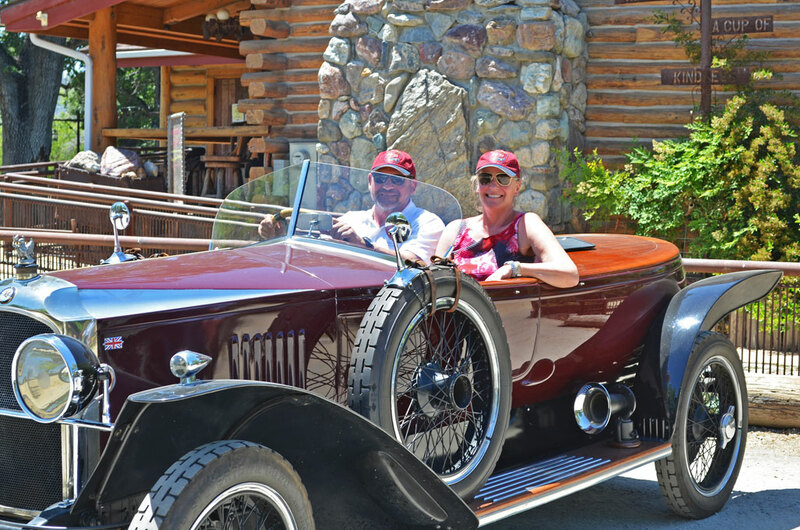 Kevin & Rona Field, enthusiastic VSCC members in Adelaide, who owned OD854 from 1962-6. We also met Garry Rainsford, Eric's son, who remembers travelling in the car in the late 60s as a teenager before it was restored. I'm sure there's still more out there, so I haven't given up digging yet! Over time, the trail simply gets colder..........so start researching today! OD1207 is owned by Martin and Sandra Button in California. Martin emailed me: 'We have owned the car twice now. I bought it from a Canadian owner, sold it in Santa Barbara, got sellers remorse and bought it back and have now owned it for about 20 years in total. It lives in Carmel-by-the-Sea and is owned by my wife Sandra and me. We have toured it in California quite extensively and have also done the Argentinean Millas Sport twice in it'. The Wensum styled body was built for Aubrey Marshall by an aircraft firm in Toronto, Canada in the 1960s. Bill Young, a jeweller from Toronto, then owned the car, and from there it moved to Vancouver and David Birchall. David owned the car from 1991-2001 & improved a number of features, including an engine rebuild to 30-98 spec. The photos below represent some of the car's life stages over the last 50 years. D3392 is without doubt a well travelled car! From Luton to Australia where it was bodied (by Jackson, Jones and Collins of Sydney) around 1921, to Ireland, then Scotland, England and now it is in California with a new owner, who has sent me the picture below. ​The car looks magnificent. 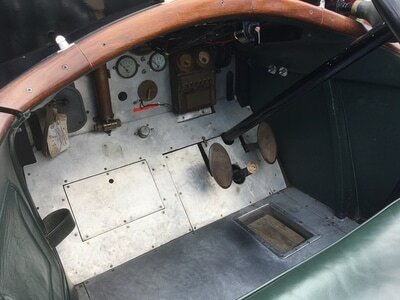 I have learned that there is an annual rally there for cars with rear brakes only: a D type certainly qualifies! Hopefully the new owner will send us 'first impressions' soon. The Australian bodied D type recently advertised for sale in UK (http://www.vintagerollsroycecars.com/sales/1295/1920-vauxhall-d-type-tourer-by-jackson-jones-colins/) is heading to California! The car, D3392, is pictured left. I have heard from the new owner, who will be shipping the car to a much warmer climate shortly. By coincidence there is another Australian bodied D type in USA: D3353 has been in Chicago for several years with Bob Lederer. I have put the two owners in touch with each other to compare notes! They say that all 'missing cars' break cover eventually. I've been searching for OD1207 for several years, and finally a recent sighting has been reported in........California! 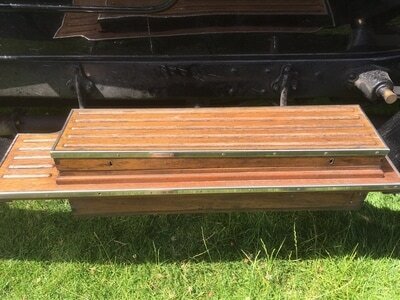 ​Now we just need the name and contact details of the current owner (please!). The Laurence Pomeroy Trophy is awarded to Nic Portway for his outstanding contribution to the history and heritage of the pre-GM Vauxhalls, particularly through his authoritative publications on these cars, especially his 2-volume history of the Edwardian Vauxhalls. The Ral Rainsford Tankard for excellence in restoration is awarded to John Burgess for his restoration and return to the road of his 1914 Prince Henry Vauxhall, D522C. The awards were the unanimous decision of the management committee of the Register and warmest congratulations to both winners. Although these are primarily for 23-60/30-98s, many Vauxhall parts of our era are similar across the models. Why not contact James and see how he can help: he's based in Dunmow, Essex. Colin Bolton has sent pictures of his 23-60 'Vauxhall Variant', registration BF7317 with engine OD1235 - generally to 30-98 spec. Body is a copy of the 1922 Vauxhall 'TT' . ​As usual, there was a very good turnout of vintage Vauxhalls at Prescott. One we hadn't seen before was Mike Holt's recently rebuilt 23-60, OD62, which was entered in the hillclimb. ​Mike imported the car from Canada a couple of years ago, and it has since been comprehensively rebuild. The car was originally assembled in Australia by David Lipsham (?) and sits on a 30-98 wheelbase. 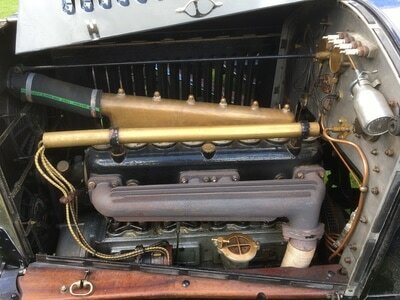 The engine has some very early features, such as a rocker cover without the holes for the HT leads, which therefore pass over the top of the engine. Mike said: "My 23/60 performed OK at it’s introduction to the VSCC at Prescott, but I drove it slowly as it was still very tight. The (first) photo shows little and large, that is the John Rowley special next to it. I spent last weekend running it in, it is now registered VX3433. No problems in 646 miles, excepting a new switch to kill the mag and the modern flasher unit. Oh and the original leather drive belt for the speedo fell off." The car pictured below (at Prescott 2017) started out life in 1923 as a 23-60 tourer and was exported to Canada. It was involved in a fire shortly afterwards, and the remains were purchased by a well known local racing driver Percy Weldon. He shortened and altered the chassis to 30/98 specification and raced the car (first & second picture). It subsequently fell into decay and parts were robbed. It was then shipped back to England about fifteen years ago. 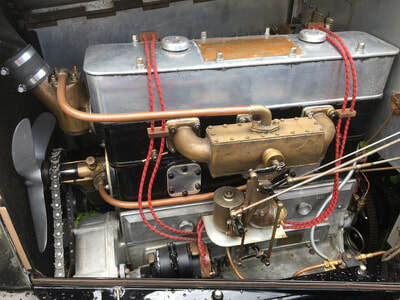 Subsequent owners have gradually transformed the remains of the car to a very potent 30-98 special, with a two seater body modelled on the period Grosvenor style. The engine number is OD122, modified to 30-98 spec. 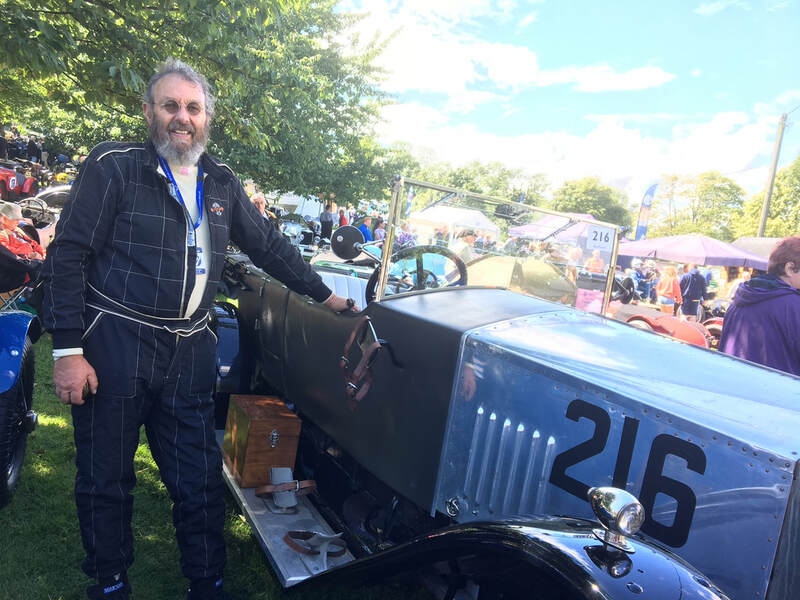 ​Kelvin New, who completed the heroic rebuild, has subsequently driven the car over 14000 miles across Europe and North Africa. Perhaps it is true that old Vauxhalls never die. They simply get rebuilt as 30-98s! ​Since C129 changed hands earlier this year, the new owner John Burgess has been extremely active driving the car and attending to one or two teething problems. At VSCC Shelsley we had the opportunity to look at the car in detail, and a fine car it is. Well proven by Tudor Roberts in competition some years back, it looks superb, and performs even better! Some photos below. Some things are predestined, and so it appears to be with D3009 acquiring me as its new keeper. My knowledge of Vauxhalls is less than ‘slim’, but the car possessed a presence that appealed, so he came back home with me. Known as ‘Dr Beattie’ after its first owner, he spent nearly 30 years unused and apparently the engine has never been dismantled. I am used to cars with limited braking, but employing the handbrake as the primary source of retardation was new to me and took some concentration. 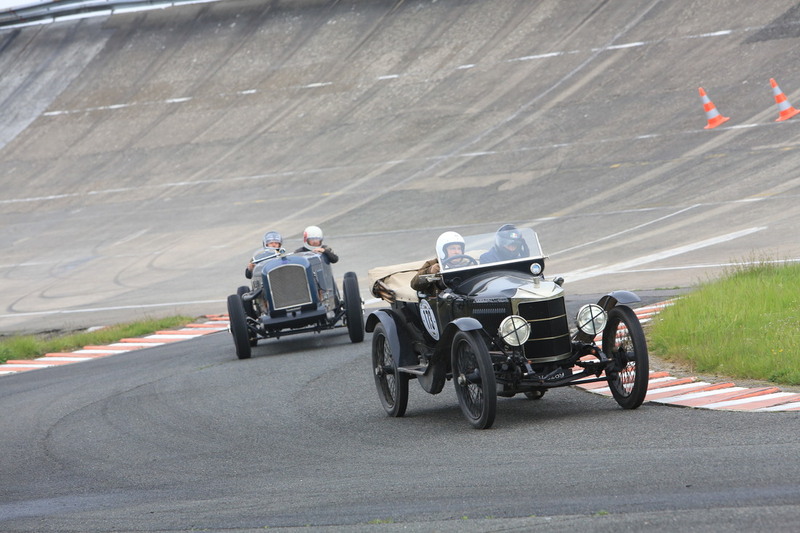 A few local trips increased confidence, and Vintage Montlhery presented the perfect opportunity for a longer trip. 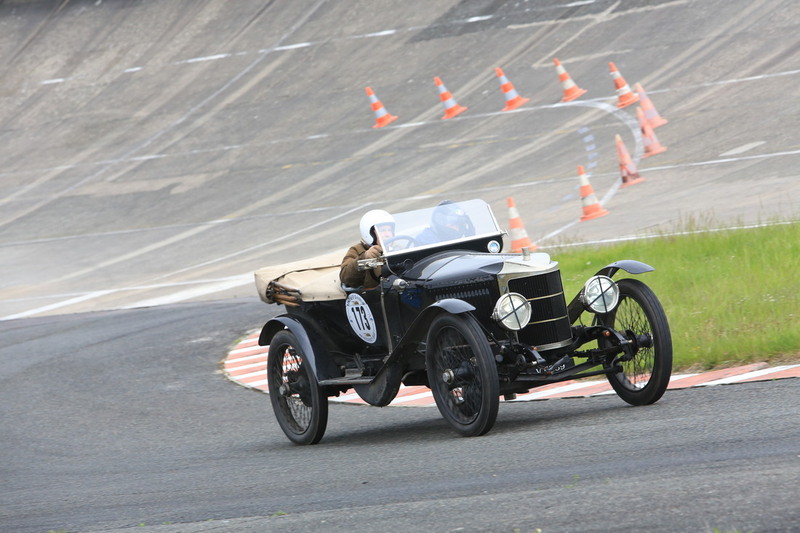 This excellent, bi-annual event, carries on a tradition started by Jaques Protherat of prewar machinery meeting at the historic banked circuit, south of Paris. 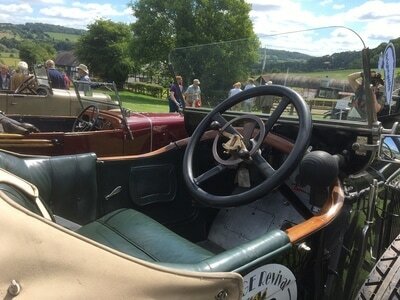 ​Probably 20 vintage cars took the Newhaven ferry on our crossing, leaving a sunny UK to arrive at a very grey Dieppe. The roads south from Dieppe are a delight and passing via Gisors and Magny, some 5hrs later we were enjoying aperitifs at our destination ,with a couple of ‘Nashes and a GN for company. The car definitely appreciates a warm up, and feels relaxed after 20 /30 mins motoring. Oil pressure drops off to 15/18psi at about 50mph, maintained by a light throttle opening that returned an mpg better than I was expecting …bonus! The weather had by this time deteriorated , and locals were heard to mention ‘temps Anglais’, but the enthusiasm was undiminished and a fine variety of prewar machines gathered in the paddock and took to the banked circuit. French Cyclecars are always a joy with some fabulously original examples of BNC, Lombard and Amilcar on show. The sad abscence of any Leyats was compensated for by a record 3 Bedelias…and plans for 5 at the next event! A Prince Henry and A-D Vauxhall were also spotted in the paddock. The return journey was equally enjoyable, deviating via Benoists grave to pay our respects to this finest of Frenchmen, and rolling into Dieppe with enough time before the ferry to savour a final bar. The whole event is run with the lightest of touch by Vincent Chamon and friends, while the marshals ,with their waves and thumbs up, could run a charm school. The next event will be in 2019, and I couldn’t recommend it more. Vauxhall was very well represented at the recent Montlhéry Vintage Revival. Alisdaire Lockhart took his A-D type, John Burgess drove over (and back!) 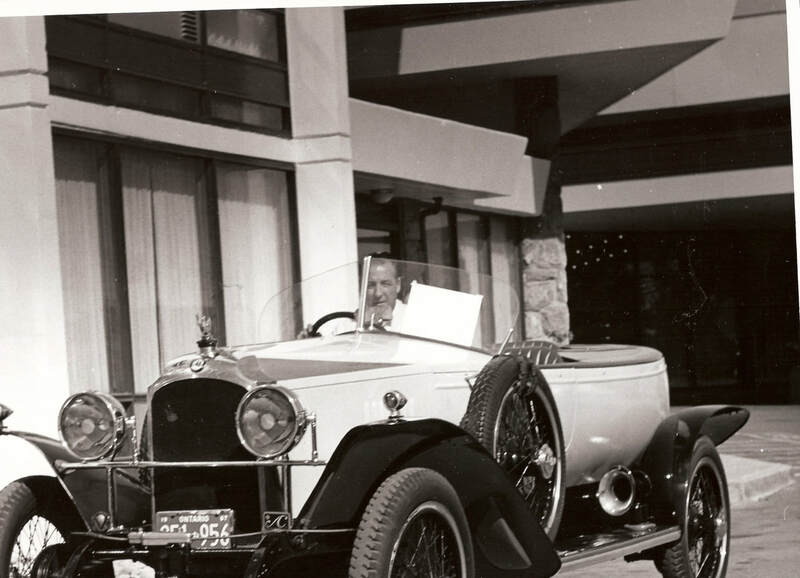 in his Prince Henry, and Peter Russell ventured abroad for the first time in his D type. Below is Alisdaire's report, together with a few photos. By all accounts, this is an event to put in the calendar for next time - May 11/12th 2019 (yes, it's every 2 years!). If I was to be granted only one regret over my near life-long romance with vintage motor-sport, it would be that I missed the first and second Vintage Revival Montlhery and only discovered this gem in the international vintage motor-sport calendar in 2015. The event is, of course, organised by Vincent Chamon and Jean-Frederic (Freddie) Frot, together with Frank Seeger for the German interest, in memory of the great Jacques Protherat, long-standing Member of the Club, not least through his friendship with Colvin Gunn and his family. The event takes place in early May once every two years, and ever increasing numbers of Club Members participate, all enjoying four sessions (two each day) of non-competitive drives around the historic circuit, catering for both cars and bikes, but VRM also includes an extensive auto-jumble (all so over-priced that no-one buys), various commercial offerings and excellent catering facilities. This year, Members of the Club must have been at least a quarter of the participants but others came from the US, Australia and Continental Europe – mainly the French, Germans and Italians, who, with the Brits were all in happy friendship – something our EU politicians would not comprehend. oil pump on my Vauxhall split, depositing half a sump full of hot old engine oil on the track which took the marshals half an hour to clean up and caused the next motor-bike session to be cancelled. How to make friends in one easy step! Memories of last weekend include: the raid by over fifty members and cars from the Fraser-Nash Club; no blue skies throughout the weekend; Ivan Dutton in his 1913 Peugeot GP car, which, as Ivan said “is nearly finished in manufacture and built to drive to Sainsbury’s each week”; Dougal’s heroics around the top of the banking coupled with his total disregard for the chicanes; Julian’s Type 35B on full song all weekend and driven with his customary determination and verve; John Burgess in his recently acquired ex-Tudor Roberts Prince Henry, arriving with a boiling radiator and a nearly cooked clutch, having worked with Jeremy Brewster to fit a new crown wheel & pinion finishing just 24 hrs before sailing to Le Havre; Rebecca Smith driving her mother round the circuit in my Vauxhall and beating Biggins into the bargain; Robin Batchelor; scrutineering that we would dream of in the UK; Andrew Howe-Davis’s pyrotechnics with his vintage bike; an event for both bikes and cars, an achievement seemingly beyond the motor-sport organisers in the UK; the wonderful array of French voiturettes, including my sister’s early Amilcar, some were immaculate while others were “fresh” from their farmyard resting place; three 1927 GP Delage, well two actually, plus the ERA Delage created by Richard Seaman, driven by Ray Potter a long time ago and then followed by a long association with the Spollon family before its departure for the US but tinkering with it to make it “go” kept my brother-in-law happy and fully occupied all weekend; the Australian couple from outside Melbourne but who keep their MG C Type in the UK for their vintage motor-sport and are both Members of the VSCC, particularly for the Club’s Newsletter and the Bulletin which keeps them informed and up to date with the latest gossip; a single ERA representing the best of English racing automobiles; my last drive, with my sister as passenger and who now wants to drive the car in the Pom 2018. The whole event is organised with the a firm but very light touch by Freddie and Vincent, and it works like clockwork: no long delays between sessions and a very friendly and flexible approach to all the competitors. The biggest challenge we faced was the drive to and from the circuit from our hotel – easy to get into the circuit but we never found the short-cut out and ended up driving down the motorway to a roundabout and back to the hotel each time. On our journey home we found a delightful restaurant in the port area of a strangely deserted Le Havre, surprising for a bank holiday, where we dined on huitres, moules ou lapin, avec vin rose de Provence - so vive La France, vive Freddie and Vincent and vive le Vintage Revival Montlhery – thank you both for a wonderful weekend and hopefully many more to come in the future. It was the best “VSCC” event outside the United Kingdom! It is becoming a challenge to keep track of all the recent changes of ownership! News from Australia (via Dave Stuart) is that D3120 has been acquired by Peter Weir. 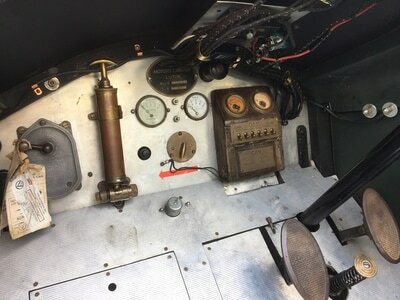 A little work is needed, and Peter intends to have it completed in time for the 2018 National Vauxhall Rally in Merimbula. I have also heard from Julian Grundy who lives Surrey. He was the fortunate purchaser of OD387 in the recent Brightwells auction (see the For Sale page). Julian says "After a 3 minute crash course in Vauxhalls after the Auction, I drove the car back to our home in Surrey without a hitch. A very enjoyable drive". There are photos of the car here: https://www.flickr.com. Finally, I have received some photos (via John Kent) of the ex Ron Roycroft 23-60 which is now with Chris Field (see below). Here's a link: https://www.flickr.com. Looks like a very handy tool! Further to the Register update below, there have been several more recent changes of ownership. Prince Henry C129 is still in UK and is now owned by John Burgess in Bristol. 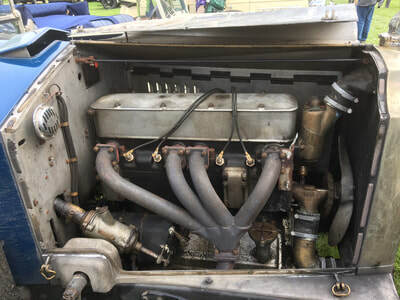 I have heard from Dave Stuart in Australia that A11.487/A11.471 (left) has moved on: Jim Weir has sold the car to Neil Heilbrunn, a long time Vauxhall owner, already in the register with OD742. In New Zealand, the 23-60 which was raced by Ron Roycrofts in the 1970s, (OD1089/OD1090) and previously in David Wright's care, has moved to the North Island with Chris Field. For pictures click here! In Canada I have finally tracked down Norm Mort who has sold D3860. 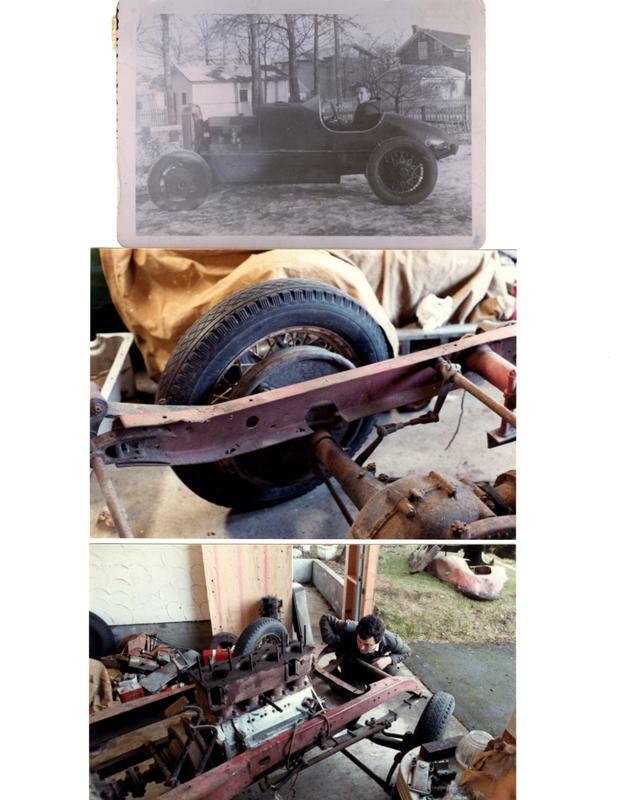 The previous owner, the late Roy Farrant restored the car, a barn find in Canada in the 1950s (left). I am awaiting details of the new owner, who I believe is in Belgium. Finally, D type D3009 is now in the enthusiastic hands of Peter Russell in Sussex. The Laurence Pomeroy Trophy is awarded jointly in 2016 to David Kirke and Dave Stuart for the outstanding contribution in creating the Register’s website and loading it with as many of the archive photographs of early Vauxhalls in the UK and Australia/New Zealand as a major contribution to the history of the marque. 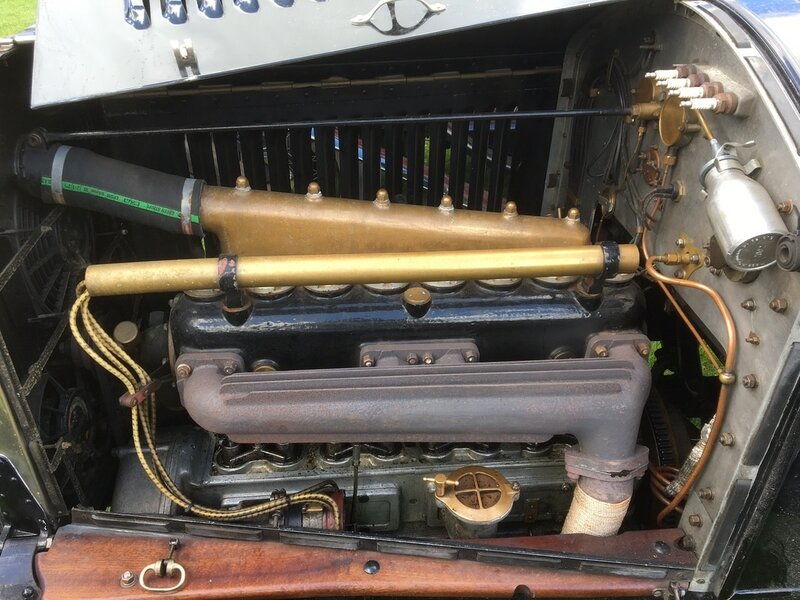 ​The Ral Rainsford Tankard for excellence in restoration is awarded to Sophie and Mark Walker for their splendid restoration (or in this case, conservation) of their 1923 Vauxhall 23-60 OD 481 and then campaigning it to events and for social driving. The awards were the unanimous decision of the management committee of the Register and warmest congratulations to all four winners. So now we know the answer: the car sold today for £516,700 including premium! The good news is that the car will stay in the UK, having been purchased by 'a collector in the north of England'. Pictures taken by Ian Parson and myself at Bonhams in London on Friday are on the Register Flickr site here. ​The ex Laurence Pomeroy Jr Prince Henry is coming to auction in December. Chassis number C97, most recently owned by the late Reg Long who sadly passed away in the summer, will be auctioned by Bonhams in London. The price estimate by Bonhams appears to reflect the impeccable provenance of this car rather than its present condition. So if you have a spare £500-600k sitting around it might be a good investment in these inflationary times! ​And Finally, in Australia, Alex Hayward is now the custodian of OD1303. 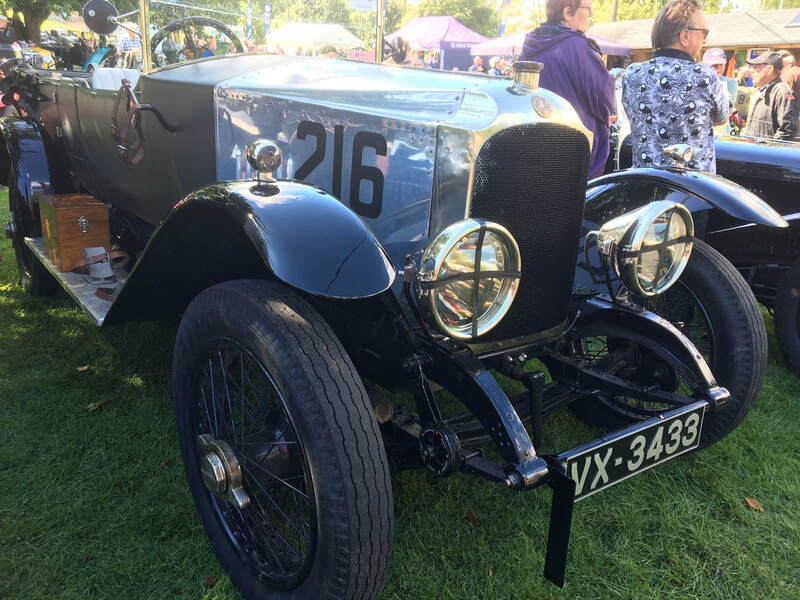 UPDATE: Peking - Paris 2016: VAUXHALL BEATS THE W O BENTLEYS! Penny, Max and Julie reached Paris yesterday afternoon after covering 14000km in 36 days in their 1923 Vauxhall 23-60. They receive a gold medal for completing the full course, and were first in Class 2: Vintage Cars 1920-1928. 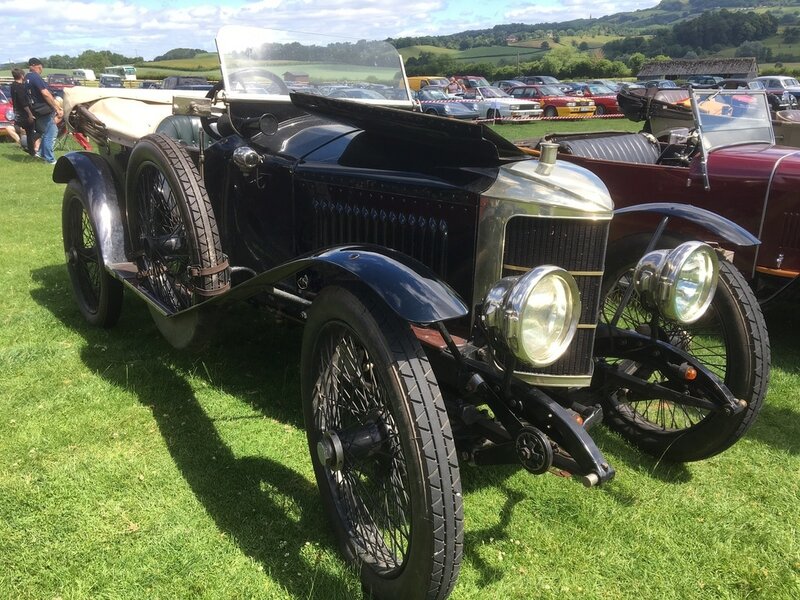 Max said 'As a results of the our effort we managed to take first in our class ahead of all the W O Bentleys and 12th in the pre 1941 Vintageant section which was won by Bruce and Harry Washington in a Chrysler 75'. ​Penny, Julie and Max are still going strong! 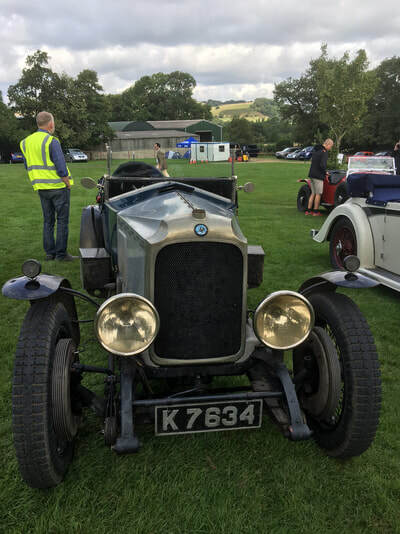 A-D Type Vauxhall Register: the annual gathering in the UK of the A-D Type Vauxhall Register will take place at VSCC Shelsley Walsh, WR6 6RP on Sunday, 3rd July 2016. 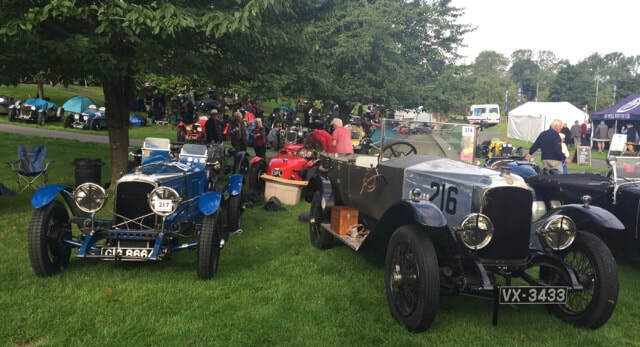 The event will take the usual format of a display of cars in a reserved area of the public car park, with the possibility of a run up the hill if there is sufficient time on the day. David Kirke, Ian Parsons and Alisdaire Lockhart will be dining on the previous evening at the Lion Inn at Clifton on Teme, WR6 6DH – around 7.30 pm, and all Members of the Register are invited to join them for dinner on the Saturday evening. 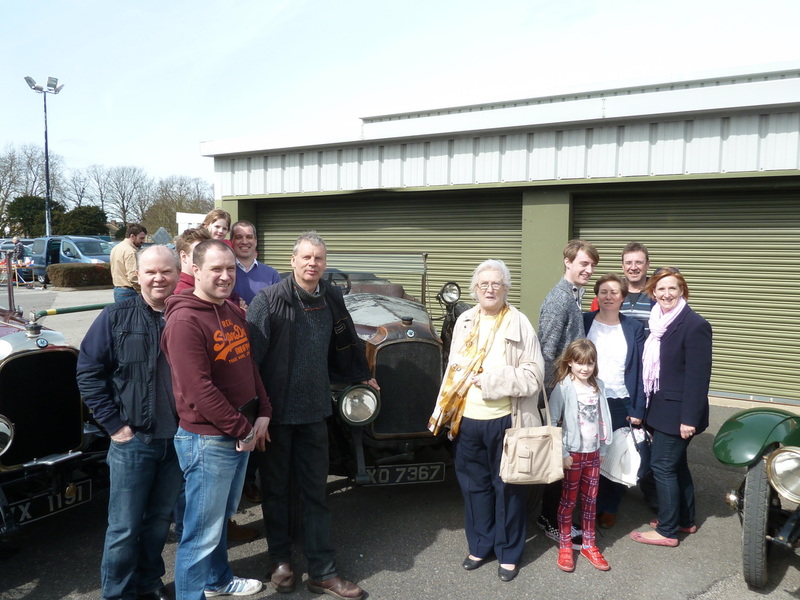 A 1923 Vauxhall 23-60, affectionately known as 'Alice', has returned to Luton 52 years after the last visit, to be reunited with previous owner Kay Lorenzato and 3 generations of her family. 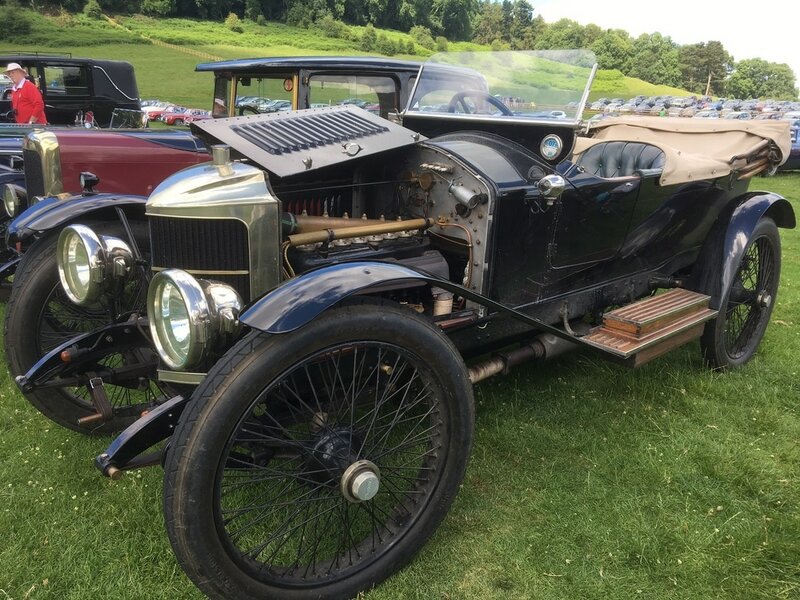 The car has been sympathetically conserved by the new owned Mark Walker over the past 18 months, retaining the car's 'barn find' appearance and even saving the original 93 year old leather trim. Kay's late husband Raymond owned the car in the 1950's and travelled extensively all over Europe - there is a Grimsel Pass sticker in the windscreen and 3 cinema tickets from Lucerne were discovered under the rear seat. 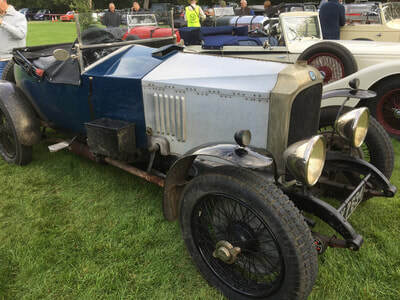 After competing in a number of Vintage Sports Car Club events in the late 1950's, the car was pressed into service again as daily transport during the harsh winter of 1962/3, after Raymond's other car, a 1953 Sunbeam Talbot drophead, was being repaired after an accident. This car is still in the Lorenzato family. Alice was last seen in Luton in 1964 at a Vauxhall 30-98 Register meeting and was on the road until 1967, after which she was laid up in the family garage with a cracked block. 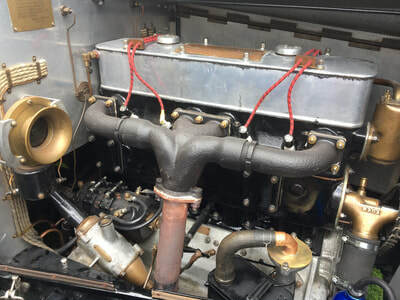 Mark has completed a full mechanical restoration, rebuilding the engine with a repaired block & new high compression pistons: 7:1 in place of 4:1! 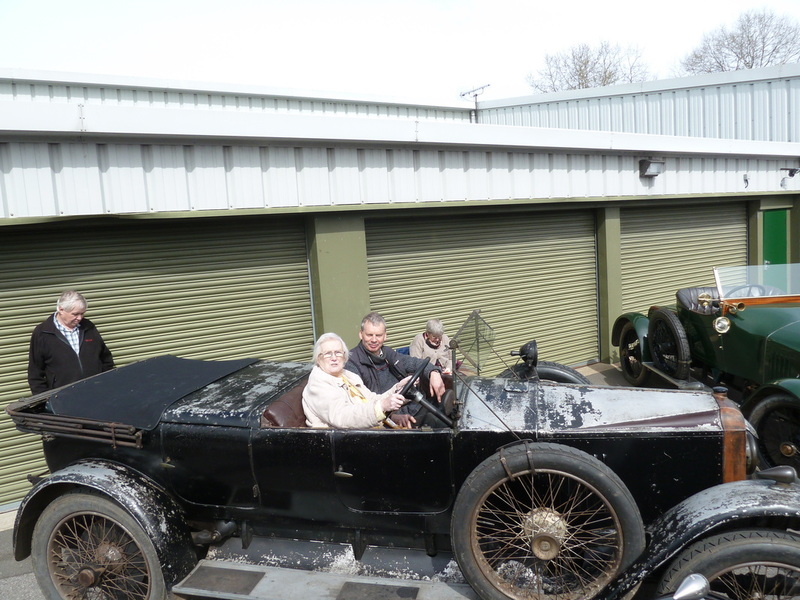 The rest of the car's appearance is fully in keeping with 90+ years of age! 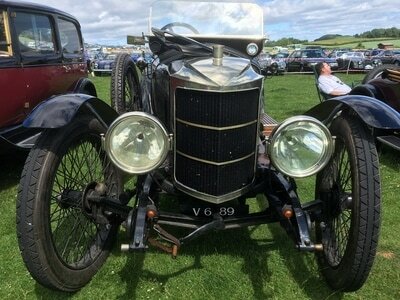 It is almost certainly the most original of the 90 plus survivors from approximate 1300 Vauxhall 23-60 models produced in Luton from 1922 -1926. The car is pictured with Mark, Kay and the family at a Vauxhall Bedford Owners' Association meeting at the Vauxhall Heritage Centre in Luton. 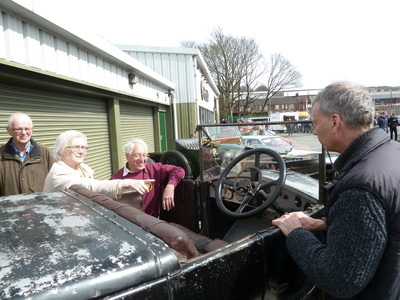 None of the family except Kay had ever seen the car running before: it had simply been the 'pile of junk in the garage' until Mark acquired the car and returned it to full running order. Both Mark and Kay are delighted with the final result. Mark commented: '60 mph @ 2000rpm is a comfortable & smooth cruising speed and the car keeps up well with modern traffic. Higher speeds are certainly possible, but with only rear wheel brakes probably not advisable. I intend to use the car as family transport and would love to recreate the trip over the Grimsel Pass to Italy via Lucerne one day'. The Laurence Pomeroy Trophy is awarded to Max and Julie Stephenson (OD 568) for their expedition in their 23-60 Penny across SE Asia to Bhutan. Copies of their report on the expedition are available from the authors on email max@twinviewturf.com.au. The Ral Rainsford Tankard for excellence in restoration is awarded to Peter Weir (A09.1) for his development of 3D printing technology for the manufacture of monoblocs for A Type Vauxhalls. Congratulations to all three winners – Alisdaire Lockhart – Chairman.